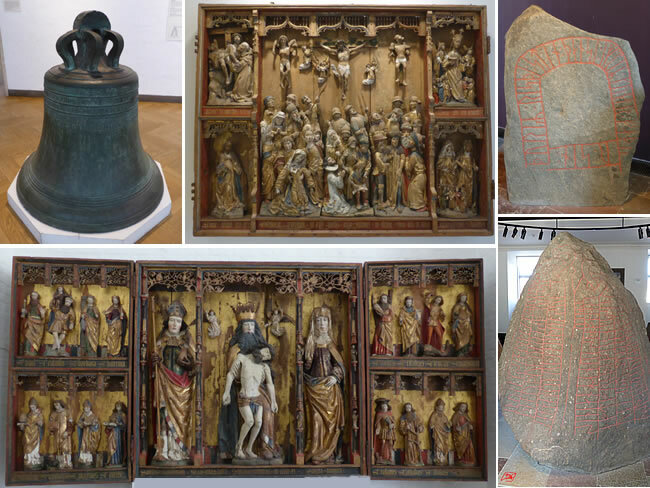 The centre top photo shows an intricately carved wooden alterpiece called a triptych The crucifixion is the main subject. It was originally bought for Esrum Abbey but after the Lutheran Reformation it ended up in St Olai Church in Elsinore. The bottom left photo shows another 3-wing alterpiece that was originally made in Northern Germany in 1511. The carved rock memorial stones date back to Viking times ie 10th century.